The campaign launched this year on the 25 November, International Day for the elimination of violence against women and girls and will run for 16 days until 10 December. The campaign celebrates the emotional strength and resilience of women by presenting a variety of women with a single flower - to those who are accessing support services, to those working within services, to local women in leadership roles and to local women in the community. This positive approach celebrates and recognises the strength of women and will also demonstrate to women, who are experiencing violence, how Blooming Strong they are. 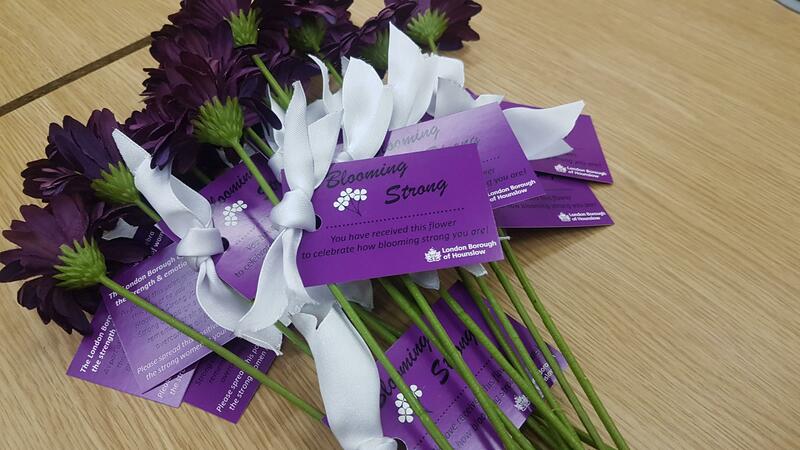 Throughout the 16 days of activism over 400 flowers will be given out to women in the borough at a range of events and locations to celebrate their strength and emotional resilience. This includes two awareness-raising stalls in the Civic Centre on 3 and 6 December 2018. Hounslow is one of only six London local authorities to be awarded White Ribbon Town status for our commitment to ending violence against women and girls. The White Ribbon Campaign was set up over a decade ago by a group of men who wanted to send out a message collectively that there is never an excuse for violence against women. The award from the White Ribbon Campaign gave Hounslow status and recognises the pledge it has made to mobilise the entire local community under the goal of ending violence against women and girls. As part of the 16 days White Ribbon packs, made in collaboration with The Reach Foundation, were delivered to all of Hounslow’s Primary and Secondary Schools (93 schools), as well as resources to hold lessons and assemblies on healthy friendships and relationships. White Ribbons are also being distributed to patients from the 5 major GP health centres in the borough. A giant White Ribbon has been placed in the Civic Centre for staff and residents to sign and join in the pledge never to commit, condone or remain silent about male violence towards women. “The council supports the Blooming Strong campaign 100 per cent and are proud to have been awarded White Ribbon Town status for our commitment to ending violence against women and girls. If you’re living in Hounslow and are experiencing abuse, please contact the Hounslow Domestic and Sexual Violence Outreach Service on 020 8247 6163 or you can attend the One Stop Shop at the Civic Centre, Lampton Road, TW3 4DN on Wednesdays between 10am – 12pm. No appointment is needed. Please wear your white ribbon in support of this far-reaching and important campaign. Together we can put an end to violence against women and girls.